First is an all-star program from the late 1950's featuring Benny Goodman, Harry James, Ella Fitzgerald, and Jo Stafford. The set opens with Ella singing "I Got A Right to Sing the Blues"; Benny's group with Red Norvo on vibes plays "Limehouse Blues"; Jo sings "How Come You Do Me Like You Do"; Benny's group plays "Poor Butterfly"; Ella sings "Hard Hearted Hannah"; Jo sings "I Got It Bad (And That Ain't Good)"; the finale features Jo and Ella singing "St. Louis Blues." You're not likely to hear that many great tunes packed into only nine minutes again any time soon. Next is an excerpt from the landmark 1958 TV series "The Subject is Jazz," which was developed for television by jazz pianist Billy Taylor and hosted by noted author and cultural scholar Gilbert Seldes. This episode was titled "The Future of Jazz" and features the compositions of jazz scholar and futurist George Russell. The tune, "Stratosphunk," is Russell's, and features Jimmy Cleveland on trombone, Art Farmer on trumpet, and Bill Evans on piano. Despite its far-out title, the tune is a just a relaxed excursion into the blues. "Stratosphunk" was also famously recorded by Gil Evans on his landmark LP Out of the Cool. The great Tennessee Ernie Ford left us a wonderful legacy of country and gospel music. His beautiful bass voice never sounded better than on this stunning 1961 rendition of "Wayfaring Stranger," from the Tennessee Ernie Ford Show. This brought tears to my eyes the first time I saw it. Anyone know who the guitarist is? The visuals are great, too. Here is a great, swinging version of "The World Is Waiting For The Sunrise" performed by Benny Goodman and Red Norvo, with their 10 piece band, televised in 1960. The great jazz pianist Dave Brubeck, who just turned 87, led one of the best small jazz groups during the 1950's and 1960's. Every member of the band was outstanding, but in drummer Joe Morello and alto sax star Paul Desmond, Dave found two artists who could continually take his musical ideas to never before imagined heights. This 1961 performace of "Take The 'A' Train" shows off the band at the top of its form. You may not be familiar with the wonderful Gypsy/"manouche" guitarist Stochelo Rosenberg, but after viewing this video I hope you take some time to check him out. He plays the acoustic guitar in the style made famous by the great Django Reinhardt. I'm probably nuts, but if I played the guitar, I would want to specialize in this style. The spotlight of this post shines on Duke Ellington, as we watch performances of two of Ellington's best-known compositions, "Perdido" and "Caravan," featuring solos by two of my favorite drummers, Sam Woodyard and "Papa" Jo Jones. First, Duke Ellington, Willie "The Lion" Smith, and Billy Taylor create a rollicking piano trio version of Ellington's "Perdido." Next, the classic, and infamous, performance of "Perdido" by the Ellington Orchestra where tenor saxophonist Paul Gonsalves passed out on stage and couldn't be revived. Great solo by long-time Ellington drummer Sam Woodyard. Finally, "Caravan" featuring drummer "Papa" Jo Jones, Harry "Sweets" Edison on trumpet, Coleman Hawkins on tenor sax, Sir Charles Thompson on piano, and Jimmy Woode on bass. You'll note that Woodyard and Jones incorporate the toms into their solos in a similar fashion. Hip-hop star Kanye West's mother, Dr. Donda West, was buried yesterday in Spencer, which is a small, predominately black community on Oklahoma City's east side (video). Donda West died last week in Hollywood, reportedly due to complications following cosmetic surgery. Dr. Jan Adams, the surgeon who operated on Donda West, is now the subject of intense professional and news media scrutiny. After briefly chatting with Larry King last night, Dr. Adams stood up and walked out of the interview. A 1967 graduate of Douglass High School, Donda attended Virginia Union University before receiving her master's degree from Atlanta University and her doctorate from Auburn University in Alabama. West began her teaching career at Atlanta's Morris Brown College in the early 1970s. A Fulbright scholar, she went on to chair Chicago State University's English department. After 31 years in higher education, she left academia in 2004 to take an active role in her son's career, serving as chairwoman of the Kanye West Foundation, a nonprofit organization created to combat the dropout rate among high school students nationwide. She also served as chief executive officer for West Brands LLC, overseeing her son's business interests. ... She was remembered by her father, Oklahoma City civil rights leader Portwood Williams, Sr., as a devoted daughter and respected educator. ... Williams said he took Donda West and his son, Portwood Williams Jr., to the first Oklahoma City lunch counter sit-ins in the 1950s. Bringing them to protests such as the 1958 sit-in at Katz Drug Store, he said, instilled a sense of justice and taught them what his generation faced. Kanye West's father, Ray West, is a former Black Panther radical who converted to Christianity and now works in Atlanta as a counselor. Ray and Donda divorced when Kanye was three, and Kanye moved with his mother to Chicago. Donda West recently authored a book entitled Raising Kanye, which chronicled her experiences as Kanye's mother and manager. Considering that his mother was a university professor, it is interesting that Kanye became so deeply immersed in ghetto culture, including its view of sexuality and white against black conspiracy theories about AIDS, crack cocaine, and the US military. Did some of this come from his father? Given that Kanye has continually promoted these conspiracy theories along with his infamous assertion that "George W. Bush hates black people," are these ideas still being promoted in academia among black scholars like his late mother? I have to wonder. LipSync-A-Rama: The Mamas and The Papas "California Dreamin'"
In 1930 the great blues singer Jimmy Rodgers recorded "Blue Yodel No. 9," accompanied by his own guitar and Louis Armstrong on trumpet and Lil Armstrong on Piano. Forty years later, Louis performed the song with Johnny Cash on The Johnny Cash Show. Armstrong's health was poor at the time; he would die a mere nine months later. But his playing is absolutely beautiful. It is the definition of "soul." And his sense of humor is as sharp as ever. Trumpeter Herb Pomeroy, 77. He is best known for his work in the early 1950's with the legendary Charlie Parker. He was later renowned as a teacher, spending thirty years at the Berkeley School of Music in Boston. Drummer Max Roach, 83. He was one of the greatest, period. He was a pioneer in the art of bebop-style drumming and an innovator in the field of rhythmic independence (each hand playing completely independent rhythms) and for his approach to improvised drum soloing, which was based around the actual melody and harmony of tunes, rather than on fills and standard rhythmic devices. Pianist Joe Zawinul, 75. He came to prominence in the 1960's as a part of the Cannonball Adderly Sextet. A decade later, Zawinul, along with saxophonist Wayne Shorter and virtuoso bassist Jaco Pastorius, formed the groundbreaking jazz-fusion group Weather Report. Anita O' Day, one of the last great surviving jazz singers of the Big Band era, passed away this morning at her home in West Los Angeles. She was 86 years old. Indestructible. There is really no other word to describe Anita O’Day. Her legacy in the world of music goes back to the mid-30s as a singing-dance competitor in the popular walkathons of the day—that is, until a truant officer returned her to school. When asked her name, she answered “O’Day,”pig Latin for dough. Which she hoped to make a bunch of. She was soon discovered by a club owner in Chicago, and within a year destiny would guide her right to the top as the lead singer for the Gene Krupa Orchestra. Anita brought to the big band her own swinging style. She had no use for gowns; she was a member of the band who’s instrument was her voice, so she donned the same uniform that the other band members wore—a suit. She stayed with Krupa’s outfit for five years, then after one year with Stan Kenton, scoring numerous hits for both. She began her solo career in 1947. Her vibrant appearance in the 1959 documentary "Jazz on a Summer's Day," a film about the 1958 Newport Jazz Festival, made her an international celebrity and brought her important dates in Japan and England. Then, in 1966, she nearly died of a heroin overdose in a bathroom in a Los Angeles office building. The experience rattled her, and she quit heroin at once. Most of her money gone, she spent the rest of her life struggling financially. In the early 1970s, she was living in a $3-a-night hotel in Los Angeles but she revived her career over the next decade, culminating in a profile of her on the CBS newsmagazine "60 Minutes." She received her first Grammy nomination in 1990 for "In a Mellow Tone" and was given an American Jazz Masters award in 1997 by the National Endowment for the Arts. 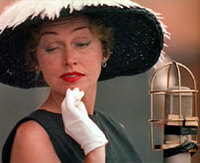 Anita will forever be remembered for the clingy black dress, fringed black hat and white gloves that she wore in the film. Ironically, she later candidly confessed that she had absolutely no recollection of her performance at Newport. Years of alcohol and drug abuse robbed her of many things including the memories of her most prosperous years. Still, she survived the needle, the bottle, two rotten marriages, depression, and dire financial straits, continuing to perform (though often precariously) well into her 80's. Here is a nice video tribute to Anita, which includes a segment of her performance of "Sweet Georgia Brown" from Jazz On A Summer's Day. Here is a young Anita performing "Thanks For The Boogie Ride" with the Gene Krupa big band in 1942. Roy Eldridge is the trumpet man. All About Jazz published this profile of Anita just a few days ago. So long Anita. It sure was groovy.